As part of our comprehensive automated machine vision inspection solutions, Mercator Robotec designs, builds, and installs custom machine control panels that incorporate a wide range of components to safely and reliably drive your automation system and fit in with your plant architecture. 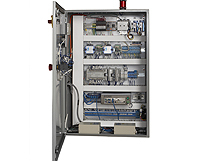 Housed in a steel or stainless steel enclosure with the appropriate NEMA rating for your manufacturing environment, our machine control panels include machine vision processors, all motion and motor controls, safety relays, PLCs, Ethernet and fieldbus communication modules, and a choice of a wide range of operator interfaces. All panel assemblies are supplied with CSA, UL or CE electrical certifications. Enclosures vary in size according to system complexity, and are supplied with the appropriate mounting style for easy access and operator safety. HMIs can range from simple display units to graphical operator interfaces all the way up to full PC touchscreen systems. Our engineering team will work closely with you to ensure that the control panel has operator-friendly controls and is easily maintained and well documented. For more information about our custom machine control panels and systems integration services, please read below, or contact us today to learn how we can help your with your application.